The Marine Corps has announced plans to roll out a universal cap for all Marines, modeled after the cover currently worn by male members, following some controversy over a unisex design. Not only that, it's tightening its regulations on what exactly can be underneath these brand-new caps. Specifically, no "faddish" or "exaggerated" hairstyles are allowed, according to a Monday administrative order approved by the Corps' top general. "Meaning... what, exactly?" asks Gawker's Adam Weinstein. "Eccentric" hairstyles are also a big no-no. The Marines define eccentric as "departing from the established or traditional norm," and faddish as "a transitory fashion adopted with wide enthusiasm," according to the Marine Corps Times. BRAIDS ... WHEN WORN, MULTIPLE BRAIDS SHALL BE OF UNIFORM DIMENSION, SMALL IN DIAMETER (APPROX. 1/8 TO 1/4 INCH), SHOW NO MORE THAN 1/8 OF AN INCH OF SCALP BETWEEN THE BRAIDS AND MUST BE TIGHTLY INTERWOVEN TO PRESENT A NEAT, PROFESSIONAL, WELL GROOMED APPEARANCE. FOREIGN MATERIAL (I.E., BEADS, DECORATIVE ITEMS) SHALL NOT BE BRAIDED INTO THE HAIR. BRAIDS MUST CONTINUE TO THE END OF THE NATURAL HAIR AND CAN BE WORN LOOSE FROM THAT POINT. WHEN WORN LOOSE, BRAIDS WILL COMPLY WITH MEDIUM OR LONG HAIR LENGTH GUIDELINES, OR BE SECURED TO THE HEAD IN ONE DIRECTION, IN STRAIGHT LINES (FORE AND AFT WHEN WEARING A BUN). THE HAIR FORMING THE BUN MAY BE UNBRAIDED. BUNS AND ENDS SHALL BE NEATLY AND INCONSPICUOUSLY FASTENED OR PINNED. These recommendations came from the Marine Corps Uniform Board, which previously surveyed Marines about their preferred hat design. 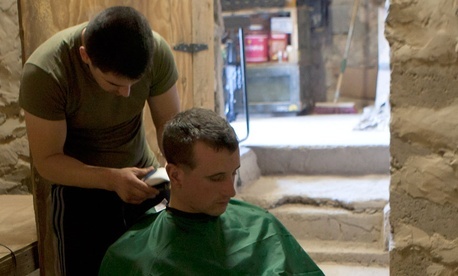 Strict rules about appearance are standard in the U.S. military. In September, the U.S. Army approved a change in its appearance regulations that would ban tattoos below the elbow or knees.